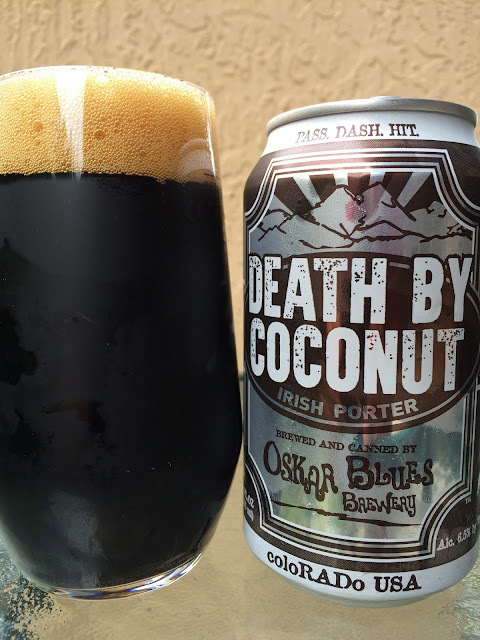 After selling out its first delivery, my local liquor store got another shipment of Oskar Blues' Death By Coconut Irish Porter. Despite its $15 4-pack and $5 single price tag, the same as the fabulous Ten Fidy and Gubna, I grabbed a can expecting to be wowed, even "killed" by this beer! Around the brim of the can. PASS.DASH. HIT... COCONUT CHOCOLATE CHOCONUT. 6.5% alcohol. Beautiful sweet chocolaty aroma, though I don't find much coconut there. But... coconut flavors are delivered in a huge way, first sip, first impression. An excellent sweet milk chocolate complement comes next, and those two run the show for the entire experience. Light roast, perhaps a hint of coffee and a good hoppy balance at the finish round things out. Pretty delicious though I was expecting a more complex beer, something more. As good as it was, I don't put it on the same tier as the other two I mentioned above. If this were priced as a value beer like other OB beers, for example Dale's and Mama's Little Yella Pils, I'd drink it all day. That being said, grab a can and decide for yourself. I love this beer, but completely agree about the price. Shouldnt be on tier with Gubbna and Ten Fidy.